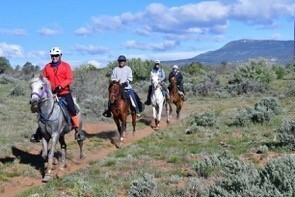 This past week we took five horses to the Mt Carmel XP Endurance Ride. Through the course of the five day ride, we had two of our horses ride day one, one horse on day two and three, four horses on day four, and one horse on day five, for a total of 400 endurance miles ridden. All of the horses on all of the days were wearing Easyboot Gloves. We never lost a single boot! And I mean in all 400 miles of crossing creeks, climbing mountains, through DEEP sand, trotting, walking, loping, we NEVER had a single boot come off. On day five, one of horses even got caught in a bog up to her hocks, and the boots still stayed on! I am such a fan of the Glove! Pictured, left to right, are Blake Potter on LC Desert Dancer, Michael Elias on TS Montecito, Jennifer Potter on LC Nobelest, and Julia Lynn-Elias on Admiral’s Cognac. All horses are in the Easyboot Glove. Next articleCustomizing the Easyboot Glove in Red and Blue.